If ancient China is your go to theme, then you are going to love this offering from Genesis Gaming. Harness the powers of the elements with Boku Slots and hopefully it will result in some big wins with Wu Xing. 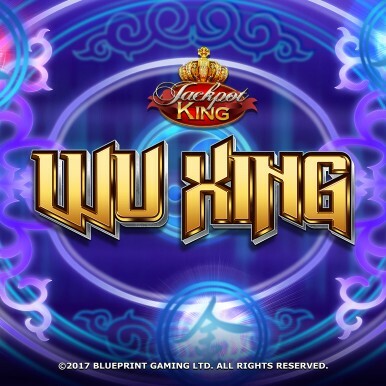 Wu Xing is a 5-reel, 25 pay line slot offering a lower than usual RTP of 92.5%, which hopefully doesn’t have too much of a negative impact on the game itself. Set in front of a barren wasteland the reels are designed to look like an ancient chinese scroll. Symbols are drawn in Chinese script and there are coloured orbs representing the Chi elements. Bet Amounts – Betting begins at 25p per spin and increases to a maximum of £500 per spin with all 25 lines in play. Be sure to amend your bet amount and the lines in play to get the right spin amount for your needs. £500 is a huge amount to be betting, so ensure after big wins you have adjusted your stake so as not to lose everything in one spin. Wild Symbol – In Wu Xing you will see the Yin Yang is your wild symbol. It will substitute for all other symbols except the scatter. Scatter Symbols – A gold gong is your scatter symbol and 3 or more will not only award scatter wins on top of line wins, but will also trigger the bonus spins. Wu Xing Feature – Enter the Wu Xing feature and you will be asked to pick one of the five ancient elements to become. You will then battle against another ancient elemental character, of which there will be one of three possible outcomes, win, lose or draw. However, you take a prize amount on any of the three outcomes which is a bonus. If you lose the battle you lose a section of the life meter at the top of the screen and four losses will end the round and return you to the main game. After each battles outcome you will be asked to pick another element to battle with. This will continue until that energy meter has been depleted. Upon receiving four losses your total wins are accumulated and added to your balance. This can be slow going sometimes as you only lose a section of energy on a loss, meaning you could go for quite some time. But its not a bad thing as for every win, lose or draw you are adding to your prize fund each and every time! Bonus Spins Feature – By landing three or more gong scatters anywhere on the reels, you will trigger the bonus spins. 10 spins will be allocated for you to play through, and the spins can be retriggered during the round. Once you enter the bonus round you will be asked to pick an element, choose from Fire, Water, Wood, Earth or Metal. At the beginning of the turn one other symbol will be chosen to turn into your selected element on each spin. Every time you land 2 or more scatters during the spins another symbol will be turned into your chosen element, until all symbols have been changed. This means that throughout the duration of the spins all element signs could be turned into your chosen element helping to create much bigger wins. Ok, so when we first hit Wu Xing we didn’t know what to expect, but boy did Genesis Gaming give us a good game? Wu Xing may take its time to get going, but once it is in full swing those base game wins happen often. Unfortunately, the same can’t be said for the bonus spins round, which seemed to take forever to land and that became tiresome. But, for those of you that enjoy a good feature don’t be to sad, as the Wu Xing feature once triggered is very profitable. It also activated more often than you would think, with it being linked to landing one of all five elements on the correct reels. Overall a great game, bit long in the tooth when the feature runs, but the money that can be won during it more than justifies the time it takes.